Proto Nazca deformed skull, c 200-100 BC. Landesmuseum Württemberg deformed skull, early 6th century Allemannic culture. 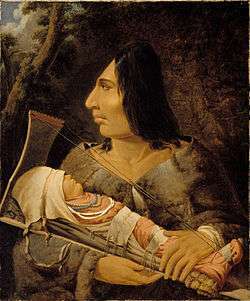 Painting by Paul Kane, showing a Chinookan child in the process of having its head flattened, and an adult after the process. Artificial cranial deformation, head flattening, or head binding is a form of body alteration in which the skull of a human being is deformed intentionally. It is done by distorting the normal growth of a child's skull by applying force. Flat shapes, elongated ones (produced by binding between two pieces of wood), rounded ones (binding in cloth), and conical ones are among those chosen. Typically, it is carried out on an infant, as the skull is most pliable at this time. In a typical case, headbinding begins approximately a month after birth and continues for about six months. Elongated skull of a young woman, probably an Alan. Intentional cranial deformation predates written history; it was practised commonly in a number of cultures that are widely separated geographically and chronologically, and still occurs today in a few places, including Vanuatu. The earliest suggested examples were once thought to include the Proto-Neolithic Homo sapiens component (ninth millennium BC) from Shanidar Cave in Iraq, and also among Neolithic peoples in Southwest Asia. The earliest written record of cranial deformation—by Hippocrates, of the Macrocephali or Long-heads, who were named for their practice of cranial modification—dates to 400 BC. In the Old World, Huns also are known to have practised similar cranial deformation. as were the people known as the Alans. In Late Antiquity (AD 300-600), the East Germanic tribes who were ruled by the Huns, the Gepids, Ostrogoths, Heruli, Rugii, and Burgundians adopted this custom. In western Germanic tribes, artificial skull deformations rarely have been found. In the Americas, the Maya, Inca, and certain tribes of North American natives performed the custom. In North America the practice was known, especially among the Chinookan tribes of the Northwest and the Choctaw of the Southeast. The Native American group known as the Flathead Indians, in fact, did not practise head flattening, but were named as such in contrast to other Salishan people who used skull modification to make the head appear rounder. Other tribes, however, including the Choctaw, Chehalis, and Nooksack Indians, also practiced head flattening by strapping the infant's head to a cradleboard. The practice of cranial deformation was also practiced by the Lucayan people of the Bahamas, and it was also known among the Aboriginal Australians. Friedrich Ratzel reported in 1896 that deformation of the skull, both by flattening it behind and elongating it toward the vertex, was found in isolated instances in Tahiti, Samoa, Hawaii, and the Paumotu group, and that it occurred most frequently on Mallicollo in the New Hebrides (today Malakula, Vanuatu), where the skull was squeezed extraordinarily flat. 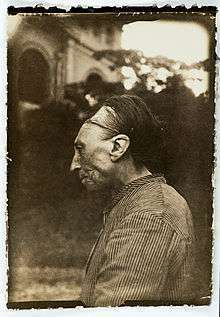 Deliberate deformity of the skull, "Toulouse deformity", band visible in photograph is used to induce shape change. Deformation usually begins just after birth for the next couple of years until the desired shape has been reached or the child rejects the apparatus. One modern theory is cranial deformation was likely performed to signify group affiliation, or to demonstrate social status. Such motivations may have played a key role in Maya society, aimed at creating a skull shape that is aesthetically more pleasing or associated with desirable attributes. For example, in the Nahai-speaking area of Tomman Island and the south south-western Malakulan (Australasia), a person with an elongated head is thought to be more intelligent, of higher status, and closer to the world of the spirits. Historically, there has been a number of various theories regarding the motivations for these practices. ...the same formation [i.e. absence of the signs of artificial pressure] of the head presents itself in children yet unborn; and of this truth we have had convincing proof in the sight of a foetus, enclosed in the womb of a mummy of a pregnant woman, which we found in a cave of Huichay, two leagues from Tarma, and which is, at this moment, in our collection. Professor D’Outrepont, of great Celebrity in the department of obstetrics, has assured us that the foetus is one of seven months’ age. It belongs, according to a very clearly defined formation of the cranium, to the tribe of the Huancas. We present the reader with a drawing of this conclusive and interesting proof in opposition to the advocates of mechanical action as the sole and exclusive cause of the phrenological form of the Peruvian race. i.e., concluding, based on these lines of reasoning, that these skulls were natural in origin. There is no statistically significant difference in cranial capacity between artificially deformed skulls and normal skulls in Peruvian samples. 1 2 Meiklejohn, Christopher; Anagnostis Agelarakis; Peter A. Akkermans; Philip E.L. Smith & Ralph Solecki (1992) "Artificial cranial deformation in the Proto-Neolithic and Neolithic Near East and its possible origin: evidence from four sites," Paléorient 18(2), pp. 83-97, see , accessed 1 August 2015. ↑ Trinkaus, Erik (April 1982). "Artificial Cranial Deformation in the Shanidar 1 and 5 Neandertals". Current Anthropology. 23 (2): 198–199. doi:10.1086/202808. JSTOR 2742361. ↑ Agelarakis, A. (1993). "The Shanidar Cave Proto-Neolithic Human Population: Aspects of Demography and Paleopathology". Human Evolution. 8 (4): 235–253. doi:10.1007/bf02438114. ↑ K.O. Lorentz (2010) "Ubaid head shaping," in Beyond the Ubaid (R.A. Carter & G. Philip, Eds. ), pp. 125-148. ↑ Hippocrates of Cos (1923) [ca. 400 BC] Airs, Waters, and Places, Part 14, e.g., Loeb Classic Library Vol. 147, pp. 110-111 (W. H. S. Jones, transl., DOI: 10.4159/DLCL.hippocrates_cos-airs_waters_places.1923, see . Alternatively, the Adams 1849 and subsequent English editions (e.g., 1891), The Genuine Works of Hippocrates (Francis Adams, transl. ), New York, NY, USA: William Wood, at the [MIT] Internet Classics Archive (Daniel C. Stevenson, compiler), see . Alternatively, the Clifton 1752 English editions, "Hippocrates Upon Air, Water, and Situation; Upon Epidemical Diseases; and Upon Prognosticks, In Acute Cases especially. To which is added…" Second edition, pp. 22-23 (Francis Clifton, transl. ), London, GBR: John Whiston and Benj. White; and Lockyer Davis, see . All web versions accessed 1 August 2015. ↑ Bachrach, Bernard S. (1973) A History of the Alans in the West: From Their First Appearance in the Sources of Classical Antiquity Through the Early Middle Ages, pp. 67-69, Minneapolis, MN, USA: University of Minnesota Press. ↑ Pany, Doris & Karin Wiltschke-Schrotta, "Artificial cranial deformation in a migration period burial of Schwarzenbach, Lower Austria," ViaVIAS, no. 2, pp. 18-23, Vienna, AUT: Vienna Institute for Archaeological Science. ↑ Tiesler, Vera (Autonomous University of Yucatan) (1999). Head Shaping and Dental Decoration Among the Ancient Maya: Archeological and Cultural Aspects (PDF). 64th Meeting of the Society of American Archaeology. Chicago, IL, USA. pp. 1–6. Retrieved 1 August 2015. ↑ Tiesler, Vera (2012). "Studying cranial vault modifications in ancient Mesoamerica". Journal of Anthropological Sciences. 90: 1–26. ↑ Tiesler, Vera & Ruth Benítez (2001). "Head shaping and dental decoration: Two biocultural attributes of cultural integration and social distinction among the Ancient Maya," American Journal of Physical Anthropology, Annual Meeting Supplement, 32, p. 149.". ↑ Elliott Shaw, 2015, "Choctaw Religion," at Overview Of World Religions, Carlisle, CMA, GBR: University of Cumbria Department of Religion and Ethics, see , accessed 1 August 2015. ↑ "Lucayan–Taíno burials from Preacher's cave, Eleuthera, Bahamas - Schaffer". International Journal of Osteoarchaeology. 22: 45–69. 2010. doi:10.1002/oa.1180. Retrieved 2013-06-06. ↑ Ratzel, Friedrich (1896). "The History of Mankind". MacMillan, London. Retrieved 4 October 2009. ↑ Delaire, MMJ; Billet, J (1964). "Considérations sur les déformations crâniennes intentionnelles". Rev Stomatol. 69: 535–541. ↑ Janot, F; Strazielle, C; Awazu Pereira, Da Silva; Cussenot, O (1993). "Adaptation of facial architecture in the Toulouse deformity". Surgical and Radiologic Anatomy. 15: 1038. doi:10.1007/BF01629867. 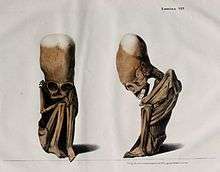 1 2 3 4 Eric John Dingwall, Eric John (1931) "Later artificial cranial deformation in Europe (Ch. 2)," in Artificial Cranial Deformation: A Contribution to the Study of Ethnic Mutilations, pp. 46-80, London, GBR:Bale, Sons & Danielsson, see "Archived copy" (PDF). Archived from the original (PDF) on 2014-09-12. Retrieved 2014-02-20. and , both accessed 1 August 2015. ↑ Anton and Weinstein, 1999. 1 2 Hoshower et al., 1995. 1 2 Gerszten and Gerszten, 1995. ↑ Tubbs, Salter, and Oaks, 2006. ↑ Colin Barras (13 October 2014). "Why early humans reshaped their children's skulls". BBC Earth. Retrieved 15 May 2015. ↑ Rivero and Tschudi (1852) Antigüedades peruanas (Peruvian Antiquities), issue 1851/1852. 1 2 Bellamy, P. F. (1842) "A brief Account of two Peruvian Mummies in the Museum of the Devon and Cornwall Natural History Society, in Annals and Magazine of Natural History, X (October). ↑ Graves, R.J. (1834). "Remarkable skulls found in Peru". The Dublin Journal of Medical and Chemical Science. 15. ↑ Martin Frieß; Michel Baylac (2003). "Exploring artificial cranial deformation using elliptic Fourier analysis of procrustes aligned outlines". American Journal of Physical Anthropology. 122 (1): 18. doi:10.1002/ajpa.10286. Retrieved 2014-03-05. Trinkaus, Erik (1982). The Shanidar Neandertals. New York, NY, USA: Academic Press. Tiesler, Vera (2013) The Bioarchaeology of Artificial Cranial Modifications: New Approaches to Head Shaping and its Meanings in Pre-Columbian Mesoamerica and Beyond [Vol. 7, Springer Interdisciplinary Contributions to Archaeology], Berlin, NY, USA:Springer Science & Business, ISBN 1461487609, see , accessed 1 August 2015. FitzSimmons, Ellen; Jack H. Prost & Sharon Peniston (1998) "Infant Head Molding, A Cultural Practice," Arch. Fam. Med., 7 (January/February). Adebonojo, F. O. (1991). "Infant head shaping". J. Amer. Med. Assoc. 265: 1179. Henshen, F. (1966) The Human Skull: A Cultural History, New York, NY, USA: Frederick A. Praeger. Wikimedia Commons has media related to Artificial cranial deformation. Reconstruction of an Ostrogoth woman from a skull (intentionally deformed), discovered in Globasnitz (Carinthia, Austria) : , , , , . This article is issued from Wikipedia - version of the 12/3/2016. The text is available under the Creative Commons Attribution/Share Alike but additional terms may apply for the media files.